This is a recipe I found in my grandmother's recipe file. Although I don't particularly remember her making it, my mom asked me to look for it because it is a cake she remembers. 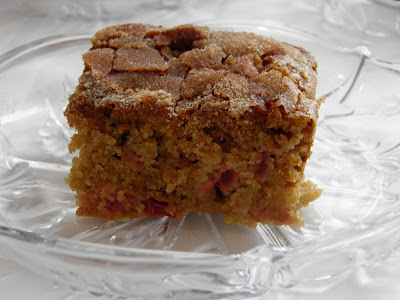 In the spring when our rhubarb was ready I decided to give this recipe a try. It is so easy and so delicious! And I actually think it tastes better the second day because the sugar and cinnamon topping has settled into the cake. 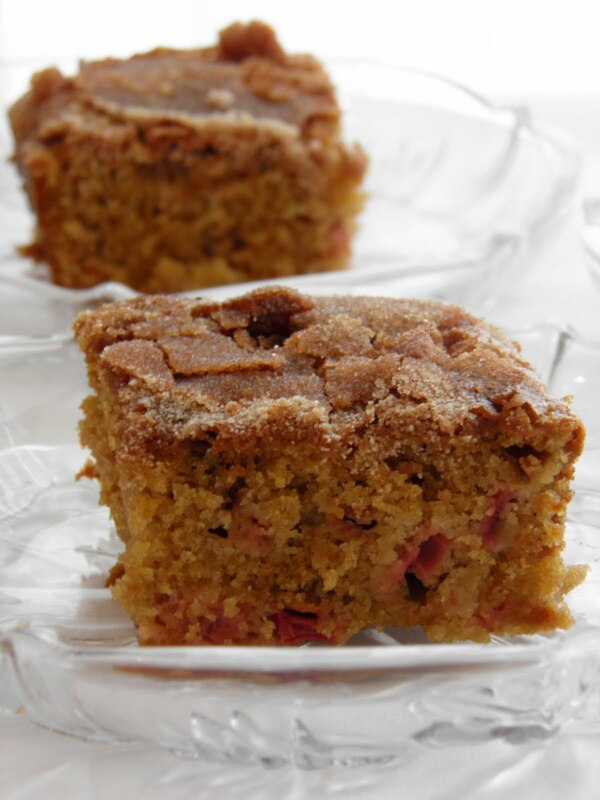 I freeze rhubarb every spring so I can make this cake in the winter. My grandma's rhubarb cake recipe. 1. Preheat oven to 325°F.2. Prepare 9x13 or 8x12 pan by spraying with cooking spray.3. Cream butter and brown sugar together in a large bowl.4. Add eggs and vanilla and stir.5. In a separate bowl, combine flour, soda, and salt.6. Alternately stir in the buttermilk and the flour mixture into the other ingredients.7. Fold in rhubarb.8. Pour into prepared pan.9. Combine sugar and cinnamon for topping and sprinkle on top of cake.10. Bake in 9x13 or 8x12 pan at 325°F for 40 minutes. Have to admit - I've never had rhubarb outside of it being combined with strawberry but these sound wonderful. I have to give it a try this summer, I've been seeing it all over the blogosphere! I love family recipes! This one looks delicious. Rhubarb is one of my favorite flavors, maybe because it is available for such a short season. I made this cake, and it had a great flavor, however I'm baking at 5,000 ft and it fell really bad in the middle. Any suggestions??? I made this cake, and it had great flavor. However, I am baking at 5,000 ft. and it fell really bad in the middle. Any suggestions?? ?